At the invitation of Foreign Minister Wang Yi, Minister of Foreign Affairs and International Cooperation of the United Arab Emirates (UAE) Sheikh Abdullah bin Zayed Al Nahyan will pay an official visit to China from 1 to 2 May and hold the first meeting of the China-UAE Intergovernmental Cooperation Committee. During the visit, Foreign Minister Wang Yi and Foreign Minister Abdullah will hold talks, co-chair the first meeting of the China-UAE Intergovernmental Cooperation Committee and have an in-depth exchange of views on bilateral relations and global and regional issues of common interest. After the meeting, the two foreign ministers will have a joint press conference. Since China and the UAE established diplomatic ties in 1984, the bilateral relationship has developed rapidly. With frequent high-level exchanges and fruitful outcomes in practical cooperation in various fields, the two countries have become each other's trustworthy friend and sincere partner for cooperation. China has always viewed its relationship with the UAE from a strategic and long-term perspective, and is ready to work with the UAE to bring the strategic partnership between the two countries to new heights. Q: It is reported that in the early morning today, the ROK transported components of the THAAD system into the site where it is planned to be deployed. What is China's comment? 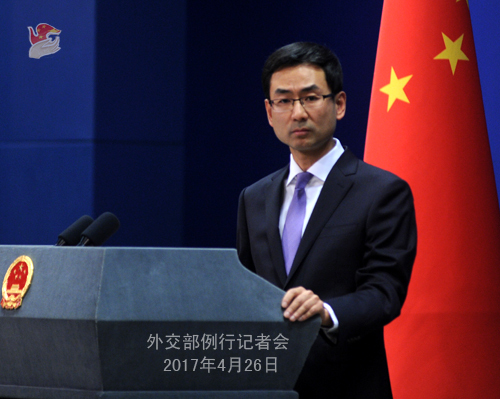 A: China has paid great attention to the relevant reports and expressed our grave concern to the US and ROK authorities. The deployment of the THAAD system in the ROK by the US and the ROK will break the strategic balance in the region and further escalate the tensions on the Korean Peninsula. It does no good to the goal of denuclearization of the Peninsula and regional peace and stability, runs counter to the efforts of various parties to resolve the issue through dialogue and consultation, and severely undermines China's strategic security interests. 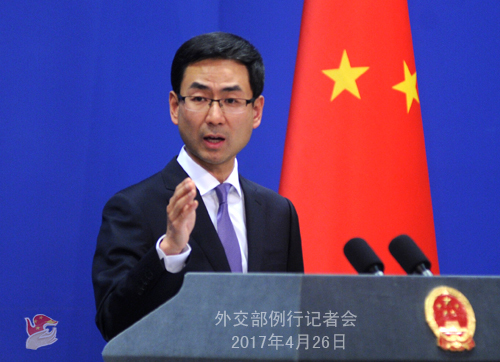 China strongly urges the US and the ROK to stop actions that will aggravate regional tensions and undermine China's strategic security interests, cancel the deployment of the THAAD system and withdraw the relevant equipment. China will resolutely take necessary measures to safeguard its own interests. Q: According to Bangladeshi Foreign Ministry officials, China has offered to help mediate on the "Rohinya" issue. Why did China offer to mediate on this issue? How far has this conversation gone? Has China spoken with Myanmar about this and at what level? Can you give us more details as to how China is going to play a mediating role? A: According to my information, Chinese Foreign Ministry's Special Envoy on Asian Affairs Sun Guoxiang is visiting Bangladesh from 24 to 27 April and has met with relevant officials of the Ministry of Foreign Affairs of Bangladesh. Regarding the Rakhine State issue, as a friendly neighbor of Myanmar, China wants to see political stability, ethnical harmony and economic development in the country and hopes the relevant issue in the Rakhine State can be properly settled through dialogue and communication among various sides. We also hope the international community can provide constructive assistance and prevent the issue from getting more complicated. Meanwhile, as a friendly country to both Myanmar and Bangladesh, China has maintained close communication with the two countries on the issue. Q: On 25 April, Philippine media reported that former President Fidel V. Ramos believes the Philippines can go on an "economic war" with China on a tiny scale in response to China's activities in the South China Sea. What is China's response? A: China and the Philippines are natural cooperation partners with close geographical location, frequent exchanges and highly complementary economies. Since the China-Philippines relationship turned around last year, the two countries have conducted cooperation in various fields and made constant progress, bringing tangible benefits to the two peoples. In this regard, I hope you will pay more attention to the recent remark of Secretary Ramon Lopez of Trade and Industry of the Philippines that the Philippine economy has gained from economic and trade cooperation with China. The leaders of our two countries have reached an important agreement on adhering to good-neighborliness, friendly cooperation, proper settlement of differences and shared development. We hope all those who insightfully focus on the overall relationship and common interests between China and the Philippines can contribute to the friendship and mutually beneficial cooperation between the two countries. Q: There have been riots in a bauxite mining region in Guinea where there are some Chinese companies involved. Has China expressed any concern to Guinea about the unrest there? What message has the Chinese government given to the Chinese companies operating there? Is China concerned that the export of bauxite from Guinea to China might be affected by this unrest? A: The Chinese side has noted relevant reports. According to our initial information, the unrest is not directly related to the production and operation of Chinese enterprises there. The local government has already begun handling the matter. We hope the issue can be properly settled. Q: We've learned that the National Committee on US-China Relations and the US thinktank Rhodium Group jointly released yesterday the New Neighbors report on the Chinese investment in the United States in 2016. The report reviewed overall Chinese investment in the United States last year and the latest trends. What is China's comment on the report? A: We've noted the report released by the National Committee on US-China Relations and the Rhodium Group. It points out that China is now one of the top sources of foreign direct investment (FDI) for the United States. In 2016, China's FDI in the United States reached $46 billion, and Chinese-funded companies added 50,000 local US employees to their payrolls. In the same year, the total number of Americans employed by Chinese-funded companies reached 141,000, a 46% increase from 2015 and more than nine times higher than 2009. These figures are limited to direct employment and do not include indirect employment during project construction or at suppliers. Of course, the report is only the result of the survey by some US institutes. But it proves again from another perspective that the economic and trade cooperation between China and the United States is mutually beneficial and win-win in nature. The two countries and their enterprises should make joint efforts to further expand and deepen economic and trade cooperation and bring more tangible benefits to the two countries and peoples. Q: According to our information, six boats loaded with coal from the DPRK unloaded at the Port of Tangshan last week. It seems to have contradicted the statement of the Chinese government that it has not imported any coal from the DPRK since 18 February. Could you give us more details and an explanation? A: First of all, I want to make it clear that China has consistently, accurately and strictly implemented UN Security Council resolutions concerning the DPRK in their entirety and fulfilled our international obligations, which is beyond doubt. Second, we issued a statement this February on suspending the import of coal from the DPRK, since which we haven't imported any coal from the DPRK. At the same time, considering the boats loaded with coal from the DPRK are severely lacking in supplies, China allows them to dock and unload cargo out of humanitarian concerns, but this does not mean in any sense that we allow the import of the coal. The two are different. China has seriously and responsibly implemented Security Council resolutions, and our decision to suspend the import of coal from the DPRK this year remains unchanged. 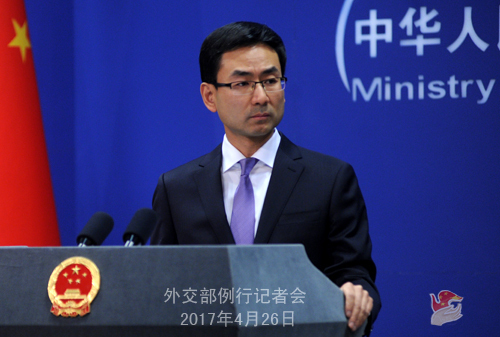 Q: It is reported that on 25 April, the Japanese Ministry of Foreign Afairs submitted the Diplomatic Bluebook 2017 to a Cabinet meeting, which expresses concern over China's increase in military spending and forces "in a way that lacks transparency", opposes efforts to unilaterally change the status quo regarding China's activities in the East China Sea and the South China Sea, and says it will "resolutely" and calmly respond to the frequent "invasion" by Chinese public service ships into the waters of Diaoyu Dao. Meanwhile, the bluebook also says the Japan-China relationship is one of the most important bilateral relationships, and Japan is willing to consolidate regional and international cooperation with China under the the framework of strategic relationship with mutual benefit. What is China's comment? A: I've noted the media reports of the China-related content in the Japanese Diplomatic Bluebook. I want to stress that China is committed to the path of peaceful development. At the same time, it also firmly upholds national territorial sovereignty and maritime rights and interests. China has indisputable sovereignty over Diaoyu Dao and its affiliated islands and Nansha islands. China's public service activities in the relevant waters are reasonable and legitimate, and we will continue to resolutely respond to any provocative action towards China's sovereignty and security. China's position on the China-Japan relationship is consistent and clear. We are willing to steadily improve the bilateral relations on the foundation of the four political documents and the four-point principled agreement between the two countries. The key is that the Japanese side should have a correct understanding of China, view the fact of China's development objectively and sensibly, properly handle disagreements and differences including sea-related issues by faithfully following the relevant documents and spirit, and avoid new disruptions to the China-Japan relationship and regional peace and stability. Q: Did China plan to launch its new aircraft carrier at the same time the ROK and the US started to deploy the THAAD system? A: The competent authorities have issued a press release about the launch of China's first domestically built aircraft carrier, which I believe all of you have read. I'd refer you to the Ministry of Defense for more details. Meanwhile, I'd like to reiterate that China pursues peaceful development and a defense policy that is defensive in nature. By developing defense forces including the navy, China is aimed at upholding national sovereignty, security and development interests and maintaining world peace. Regarding the THAAD system, China's position against the deployment of the system in the ROK by the US and the ROK is very clear. We've also stated once and again that China will resolutely take necessary measures to uphold its security interests and regional strategic balance. Q: China and ASEAN member states are currently working on a Code of Conduct for the South China Sea (COC). Both sides are saying that smooth progress has been made. Will China support a legally-binding and enforceable COC? A: With joint efforts of China and ASEAN countries, the situation in the South China Sea is cooling down and taking on a positive momentum. The relevant parties have returned to the right track of resolving disputes through negotiations and consultations, and are fully and effectively implementing the Declaration on the Conduct of Parties in the South China Sea (DOC) as well as actively advancing the consultation on a COC. According to my knowledge, China and ASEAN member states have agreed to seek to conclude the consultation on the draft of a COC framework by the first half of this year. 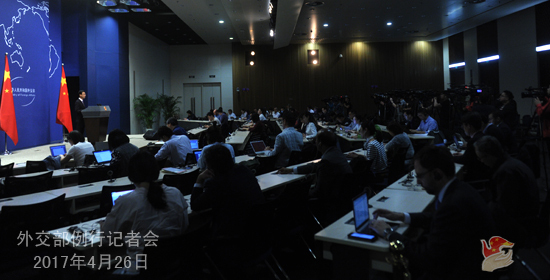 Q: China has stressed many times recently that China and the US have maintained close communication on regional issues. This morning, the US suddenly transported components of the THAAD system to the site it is to be deployed. Had the US communicated with China on this matter before? Could you tell us whether China will take any countermeasures? A: China has lodged stern representations with both the ROK and the US about the THAAD system. The US side should know very clearly China's position on the issue. As for what measures China will take, I'd like to reiterate that China urges the US and the ROK to stop the deployment immediately, and China will resolutely take necessary measures to uphold its security and regional strategic balance. Q: Can you tell us if Foreign Minister Wang Yi is going to the US later this week where he will meet US Secretary of State Tillerson? A: You haven't been here for a long time and this question has been asked many times recently. I can say it again that the UN Security Council will hold an open ministerial meeting on the Korean nuclear issue this Friday, and we will release further information about China's participation in due course.